We have all seen them. 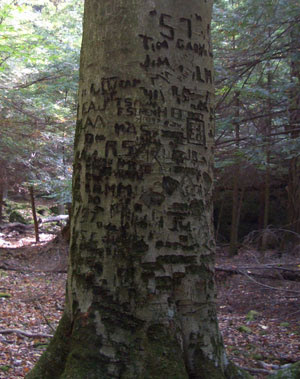 Sets of initials carved into the bark of trees, the letters often kept company by an encircling heart. While the relationships so commemorated may end up going the way of autumn leaves, the scar and damage to the tree is permanent. The reason? A tree's food and water transport systems, the phloem and xylem respectively, are directly under the bark of the tree. When you cut into the tree, you sever this thin vascular system, preventing nutrients from traveling from the roots to the leaves. Cutting into the bark also provides an opening for pathogens and resulting tree diseases. So rather than a commemorative carving, how about a Commemorative Tree planting?